Struggling Aston Villa were the visitors to Goodison Park on Saturday. Buoyed by a point and a clean sheet against title chasing Manchester City in new manager Remi Garde’s first game in charge in their previous league outing, Villa were set up to frustrate Everton from the off. Jordan Ayew (number 19) was their only striker, and ploughed a lone furrow as the most advanced man for Villa. 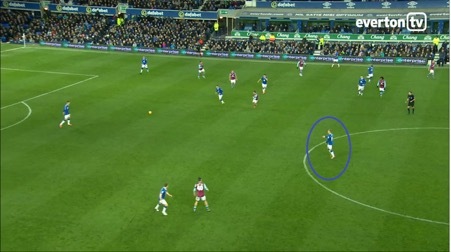 Challenging Everton with a bank of four and five in the opening stages, Ayew was often the only player Villa had ahead of the ball as they sought to frustrate the toffees. 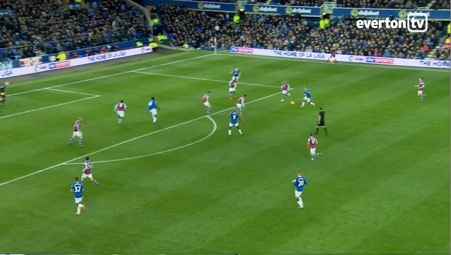 Everton had Gerard Deulofeu (number 19) advanced in support of Romelu Lukaku (number 10), joined by the intelligent movement of Arouna Kone (number 9) and Ross Barkley (number 20). Grealish didn’t have the stomach for the fight all afternoon, and even looked disinterested at times. He wasn’t the only one, in his semi-defence. 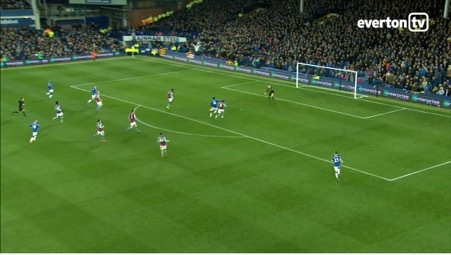 It took just sixteen minutes for the first goal of the game, and it came Everton’s way. 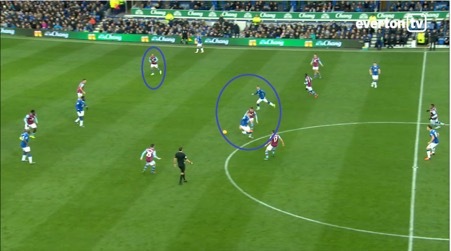 Five midfielders on the pitch, ten men banked behind the ball in the opening stages, and nobody has thought to look over their shoulder and track a simple run. 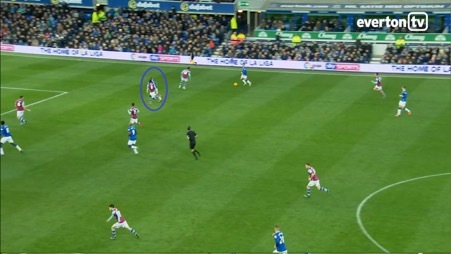 Brendan Galloway could just have easily put the ball in, such was the defensive disarray of the Villans, with Alan Hutton having been dragged inside by the movement of Arouna Kone. 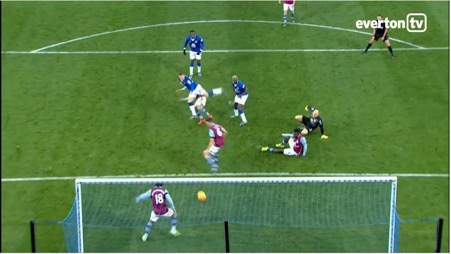 The Ivorian made a good contact with his shot and brought about a superb reflex save from Guzan in the Villa net. to become only the fifth player under the age of twenty three to score fifty premier league goals (joining Michael Owen, Robbie Fowler, Wayne Rooney and Christiano Ronaldo in the exclusive club. Not bad company). Lukaku’s firing on all cylinders at the moment and it’s clear to see how much he relishes playing alongside Kone and Deulofeu. Villa were offering nothing. 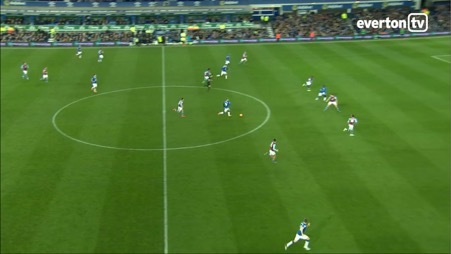 Their obvious plan to sit in and frustrate Everton was undone by an early goal, and they were incapable of adapting and responding. 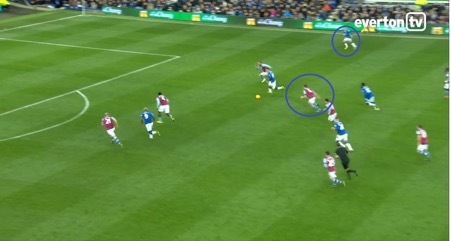 Their only half threat of the half coming off the back of a sloppy piece of play by Funes Mori as he lost the ball on the half way line, and Villa broke. A shot from distance skewed badly wide was the result, but Everton were never in any danger from the Midlanders. You couldn’t help but think of how impotent Everton have been made to look at times by teams sitting in deep,playing a stubborn game and proving difficult to break down over the last eighteen months. Lesser sides have stood toe to toe with Everton and refused to blink, and Everton have been incapable of breaking them down. That wasn’t the case on Saturday. Tempo, movement, fluidity, invention, and of course: Deulofeu. Everton were brilliant. Villa were poor, but they were made to look poor, too. If we can find the consistency to our play that has been missing through the first third of the season, and play with this intent going forward, we have an excellent team. 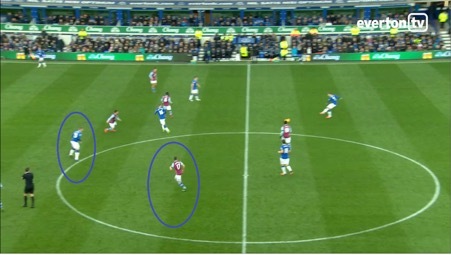 Gareth Barry was brilliant: breaking up play, assured in possession, he was the metronome in the middle of the park. 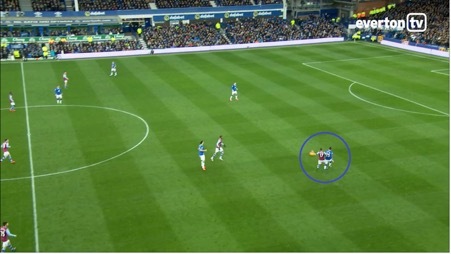 Arouna Kone had a very good game, too, but they were the only two ‘older’ players in the Everton outfield. An exciting, young nucleus of Barkley, Stones, Deulofeu, Lukaku, and Galloway: each threatening a very bright future, should we be able to keep hold of them all. It was a scrappy goal, not in keeping with the rest of the days goals- but not in keeping with the type of goals you might associate with Barkley, either: neither of his goals were. 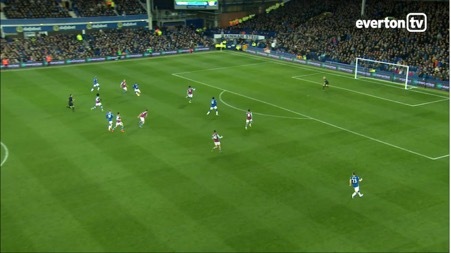 It’s encouraging to see Barkley being in the right place at the right time and score the two he did. 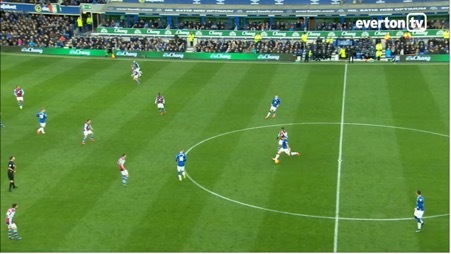 It’s testament to his continuing development… He could’ve hung back after his flick for the first, but he saw the space on the Villa back post and took a chance that paid off. 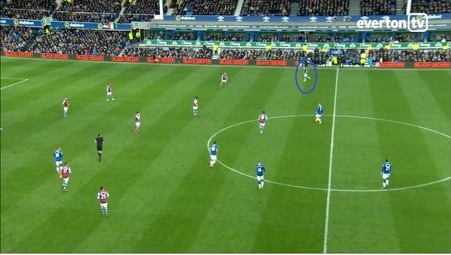 He put himself in the right place at the right time for his second, and these two goals will please Roberto Martinez every bit as much as Barkley lashing one in from distance- even though they weren’t as easy on the eye. Barkley would end the game with two assists and two goals, meaning through 13 league games, Barkley has scored 5, assisted 4 and created 24 chances for his teammates- he scored 2, assisted 2 and made 33 chances for others in the whole of last season. Our diamond is beginning to really gleam. But Barkley opens his body up, and plays the most perfectly weighted pass into the run of twenty two year old Romelu Lukaku. Lukaku, for the 51st time in his premier league career, finds the back of the net…. It’s a goal of the highest quality. Devastating stuff from the toffees. There was still time for nineteen year old Brendan Galloway to almost score the fifth of the game. 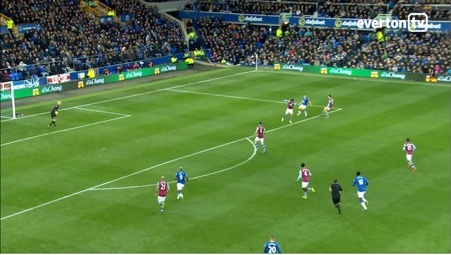 Up inside the opposition six yard box with minutes to go at four nil up, just as he had been for the first of the game in the opening fifteen minutes, his half volley struck substitute Kevin Mirallas before it had a chance to test Brad Guzan in the Villa net.